I'm back with another card to share using the fun, colourful Simon Says Stamp May 2016 Card Kit. I can't get enough of the Lawn Fawn Perfectly Plaid 6x6 Papers that came in this month's kit...or the sequins... or the sweet stamps. I'm having so much fun with the fresh colours and sweet images. If you're interested, you can pick up the Simon Says Stamp May 2016 Card Kit for just $29.95 + shipping. If you'd like to receive this kit and future kits for only $24.95 + shipping per month, you can SUBSCRIBE HERE. 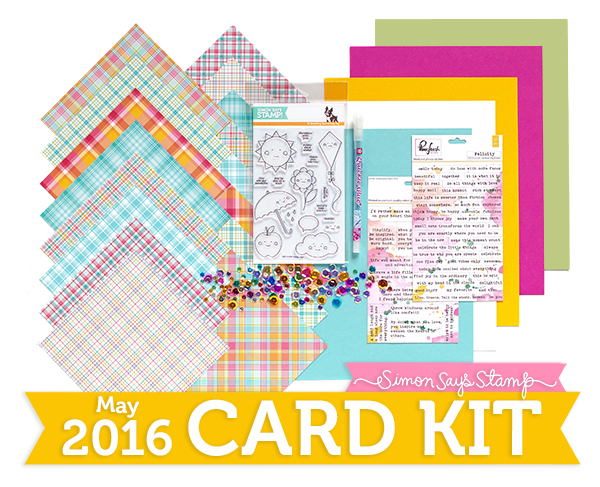 Heidi, owner of Simon Says Stamp, has given me an extra May Card Kit to pass on to one of you! Just leave a comment on any or all of my May Card Kit posts and I'll announce a winner Wednesday April 27th. Looks to be an awesome card kit. I would love to have this one. Oh yes! Those plaid papers are wonderful. I love the contrast of the circles with the straight lines of the plaid. Great way to use those beautiful papers. What a great way to showcase all those fabulous plaids! I love the yummy colors in this fresh new kit. Adorable Sarah!! This card is beautiful! I love the plaids, too - such pretty spring colors. Thanks for the chance to win! Darling card and a lovely kit! Thanks for the chance to win! Love this polka dot card! So bright and cheerful. This kit looks so fun. Such a fun card! I LOVE those plaid papers! Would love this cute plaid kit! what a great way to use pp bits! Cheerful, bright and what's not to love with all the plaid, beautiful design!!! I'm loving the plaid papers! What a fun and pretty background! Love your use of the plaid papers! Awesome use of the patterned paper! Fun card! Love the way you used the patterned paper! Love all those fun circles! Fabulous way to use those papers, love the design and layout!! 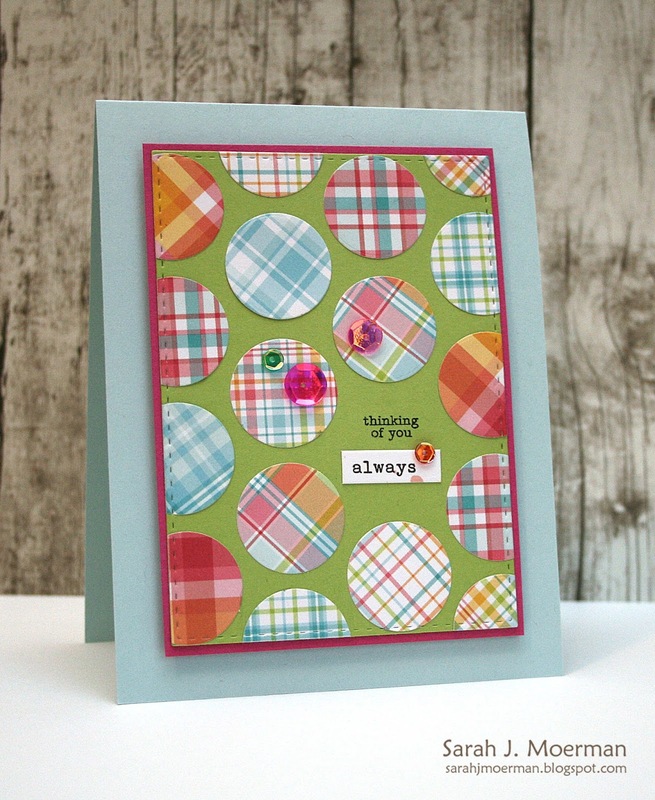 Those plaids are lovely and I love the design of your card. Fun bright card. So colorful. What a fun and cute card! Love love the colors! Love the patterned papers in this month's kit, And all those yummy sentiment stamps. Your card is awesome---love all the different circles and the stitching! Your card is so cute. Loving the plaid paper in this kit. This is so different it just grabbed my attention. What a great way to use all of those pretty patterned papers! So fun too! Thanks, Sarah. This card is sweet with those circles! Love the pattern papers from this kit. The papers in this kit are so awesome! I ordered a pack from Lawn Fawn but I haven't used it because it's too pretty! I guess I can stop hoarding now!